The most famous weapon associated with Durga is the Trishul or the trident. 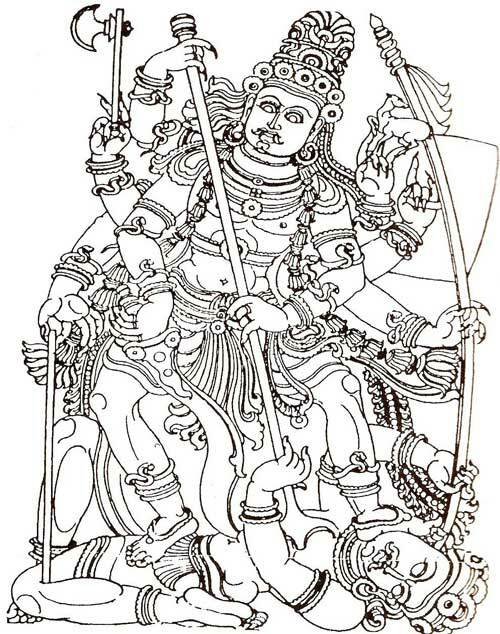 The trident is always part of the iconography of Goddess Durga killing demon Mahisha – the Mahishasura Mardini. The Goddess is depicted as killing the demon with the Trishul. The Trishul symbolizes the balance of the three forces of preservation, creation and destruction. Demons hamper with the balance and Mother Goddess corrects it using the Trishul. Another popular weapon associated with Durga is Sword. Sword represents knowledge – Razor sharp knowledge that cuts through ignorance. Another weapon that Goddess Durga uses is the Sudarshana Chakra or discus. The ever revolving discuss in the index finger has a deep symbolism. The discus represents all the desires and attractions in the world. We have to remain rooted in the Supreme Mother – be the index finger. If we waver, the finger gets bruised. Desires and attractions only create bruises. Another popular weapon associated with Goddess Durga is the bow and arrow. It is not easy to use bow and arrow successfully. It needs lot of discipline and training. The mind should be trained in such a way that it should not get distracted and should always reach its goal – the Supreme Truth. Thunderbolt – This is a rare weapon associated with Goddess Durga. This is the light that removes darkness created by ego, jealousy and ignorance. The darkness that keeps a devotee away from the Supreme Truth.